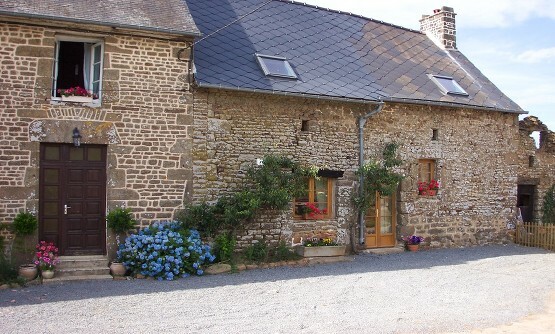 Are you looking for a happy holiday in the beautiful rural countryside of Normandy? English owners Alex and John and the animals would love to welcome you to La Richardière - rural gites in Normandy but bordering on Brittany and Pays de la Loire. La Richardière is a tranquil hamlet a stroll away from the sleepy Normandy village of St Siméon. The bocage is very rural being mainly devoted to the orchards and Normandy cows, which produce the cider, calvados and Camembert cheese for which the area is renowned. The cottage is built of the local stone (granite) and dates back to the 17th century. It has a wood burning stove and electric heating. Lounge with UK freeview TV, DVD, CD player and radio. 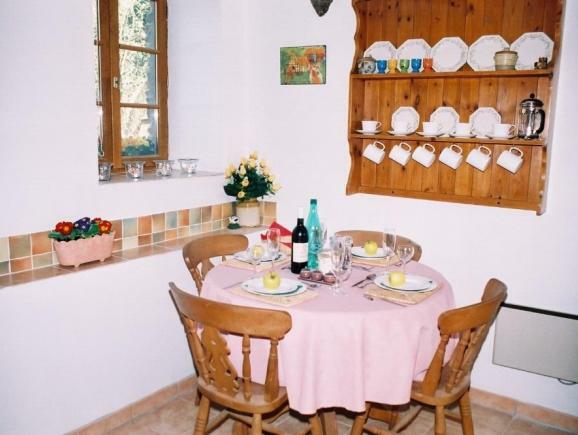 Kitchen / dining room fully equipped with dishwasher, washing machine, cooker, fridge and microwave. Downstairs toilet with hand basin. Upstairs bathroom with toilet, wash basin and bath with shower over. Three bedrooms comfortably accommodating 1 double, 1 twin and 1 single. Cot and high chair are available free on request. There is an initial supply of logs with a small charge for more. The cottage is built of the local stone (granite) and dates back to the 1700s. It has the benefit of electric heating and double glazing. Living area with UK freeview TV, DVD, video, CD player and radio. Kitchen area fully equipped with washing machine, cooker, fridge and microwave. Upstairs bathroom with toilet, bath, separate shower and washbasin. Two bedrooms comfortably accommodating 1 double and 1 twin. Living area with UK freeview TV, DVD, CD player, radio and a fold-down sofa bed. Upstairs spacious shower room with toilet, shower and washbasin. Comfortable double bedroom with ample room for a cot. Website Designed By Red Mason (www.redmason.online).